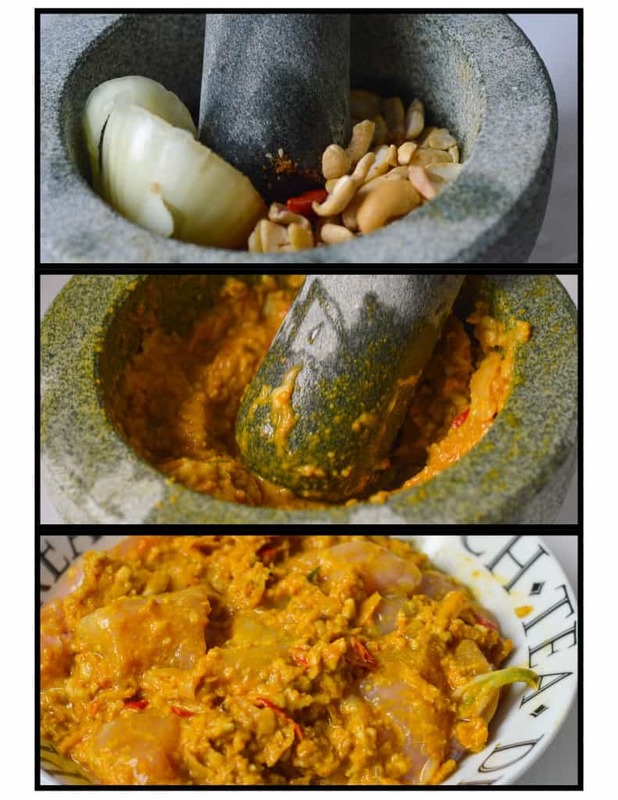 Thai cashew chicken curry – succulent chunks of chicken breast seasoned with turmeric, crushed cashews, ginger and palm sugar cooked to a thick yellow stew. I’m a huge fan of Asian cooking which is what inspired me to make this Thai cashew chicken curry in a hurry. Hurry being the operative word because it take roughly 20 minutes to cook this low fat, high protein Asian cuisine. The closest I have been to Asia is the UAE, one day I will make it to Thailand, The Philippines or even Japan. There are so many beautiful places in this world to visit, sometimes I wish I had the ability to travel around the world, for now I will dream about these wonderful countries and add them to my ever-growing bucket list. When I visited the UAE in October last year I was amazed at the large number of Thai and Pinoy (Filipino) that was present. The numbers are far more superior to that of the UK, with such a large ethnic group comes a community setting – houses, stores, clinics, restaurants just to name a few. This influx of East Asians brought a host of Thai and Pinoy restaurants, giving me the luxury of being able to pick, choose and refuse at my leisure. Being the inquisitive woman that I am I dined at some authentic Thai/Pinoy establishments. The food was scrumptious and almost a contrast to what’s accessible in the UK. Another reason why I went restaurant hopping was to learn more about the flavours and to procure inspiration for my very own blog – That Girl Cooks Healthy. After each visit I made a note of ingredients to experiment with and BAM the Thai Cashew Curry was born. You’re going to get a lot of life from this recipe, it’s brimming with flavour and a zesty flare. It’s heavily prominent with anti inflammatory ingredients like coconut palm sugar, turmeric, ginger, garlic and lemons just to name a few. I specially tailored the recipe to be low glycemic to avoid any spike in insulin levels. If you have one, I do recommend using a mortar and pestle. In fact I intend to introduce this bad boy to many of my recipes. If you want to replicate moi, do try to purchase a set. I brought mine (made of granite) for £9.99 ($20) which is reasonably priced for its large size. There’s always the option of substituting the mortar and pestle for the food processor, but there’s something more authentic about crushing spices into a paste with a mortar and pestle. After all this culinary tool was once used for medicine and is still used in many countries worldwide. As always I do recommend allowing the paste to infuse the chicken for several hours or overnight. This is the time where it’s crucial for the flavours to penetrate and bring out those lovely flavours during cooking. You don’t need a wok or a wok styled pan to cook the chicken, a heavy duty frying pan is suffice. What seals the deal with this recipe are the key notes – coconut milk, ginger, lemon and the coconut palm sugar. I feel all of those ingredients work well together and bring out the flavour of the cashew curry. 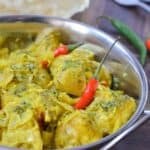 What to serve Thai cashew chicken curry with? 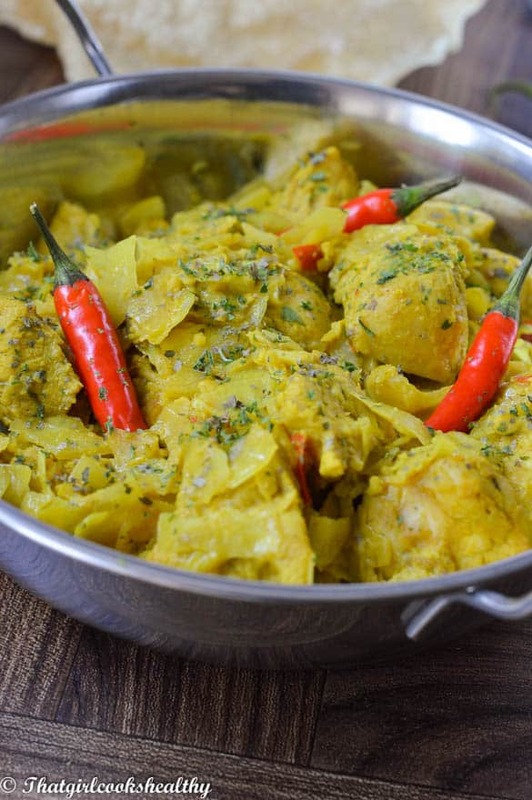 Cabbage is a great way of getting some extra veggies into this curry. Rub the chicken chunks with the Himalayan pink salt and set aside. Add all of the ingredients excluding the coconut oil and tapioca flour to the mortar and paste and crush into a smooth paste or use a food processor to create a paste. Coat the chicken with the paste, rubbing in evenly. Allow the chicken to marinate for several hours or overnight in the refrigerator. Melt and pour the coconut oil into a heavy duty frying pan on low to medium heat. Sear the chicken for 5 minutes, the chicken won’t turn brown due to the high yellow hue. Searing the chicken will allow the flavours to deepen and seal. 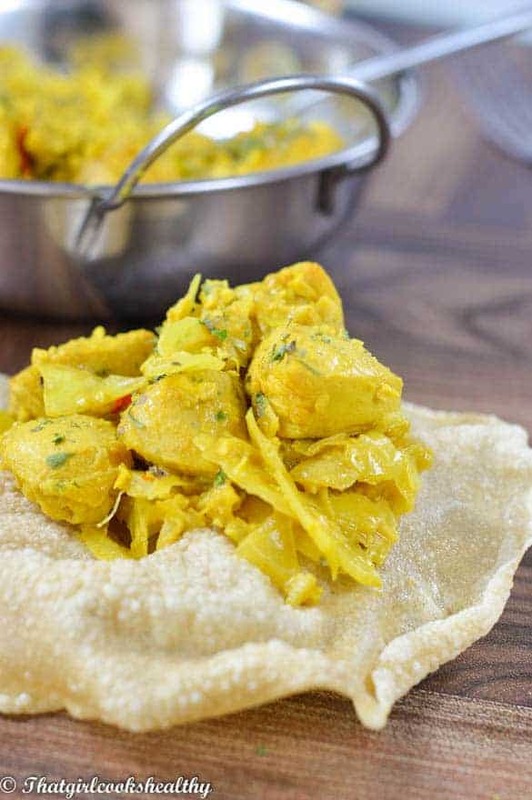 Stir the tapioca flour into the coconut milk, add this and the chopped cabbage to the pan and reduce the heat to low. Cover the pan with a lid and let it simmer for 15 minutes, stiring occasionally until the chicken is tender and sauce has thickened. Yummy! Beautiful colors. I have tapioca flour and was wondering what other dishes I could add it too. Thanks for the tip Charlene. Thanks Gemma, glad I can inspire you to use the tapioca flour in this recipe. I’m sure your wife cooks up a storm with Asian cuisines, but yes feel free to showcase this recipe to her. I’m sorry to hear that, I have other recipes that aren’t as spicy which I will be adding to the blog very soon. Hopefully those may cater to your need. I love Asian food too so I’m going to give your recipe a try. Most importantly, it doesn’t sound too spicy, so I can give it to the kids too. Usually our chances of a nice spicy dish are limited by young sensitive mouths! This looks yummy! I will have to try this, but can you tell me how I can make it less spicy? My family can’t handle peppers at all (sensitive tongues and tummies). Will it taste ok without the peppers? Terie, don’t be fooled by the chillies, I deseeded the chilli and removed the membrane and seeds, that is where the heat is. It’s generously seasoned but definitely not flaming hot, so it should be fine for yourself and the family. If anything you can removed the chillies and the curry should taste just as nice. 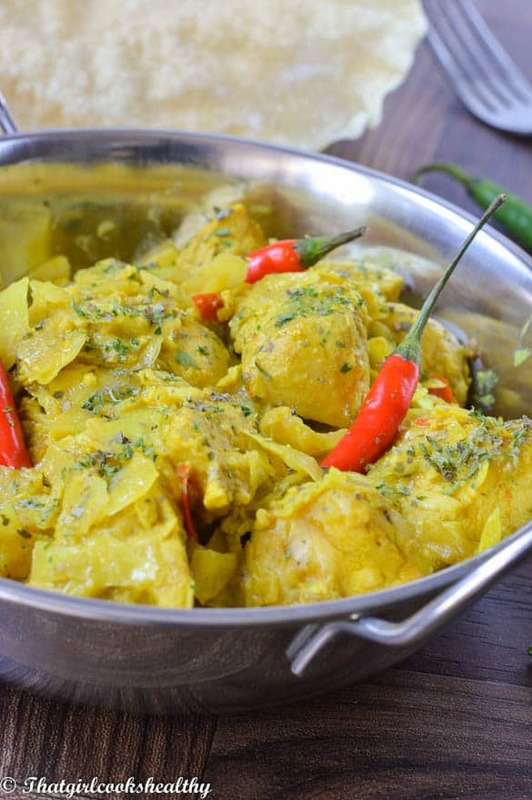 I actually looked at some Mauritian recipes a week ago but haven’t sampled them yet but I will do for sure. I love Asian foods and spicy foods! 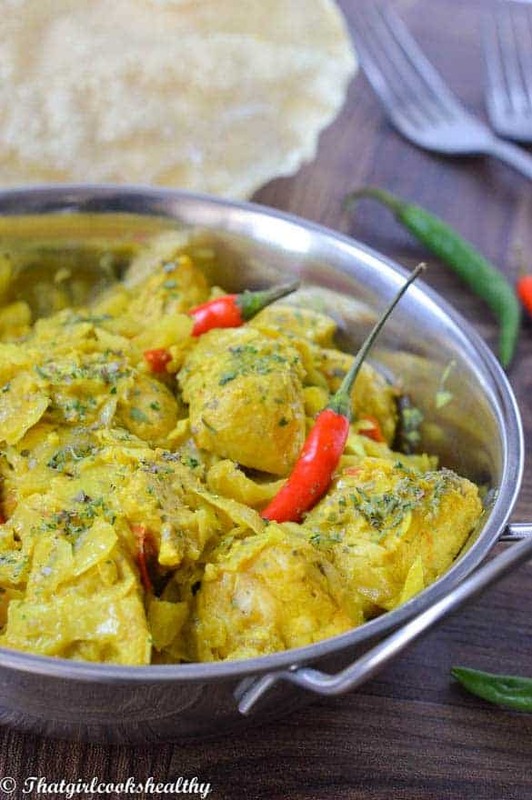 This curry looks amazing! Cashews are one of my favorite foods.